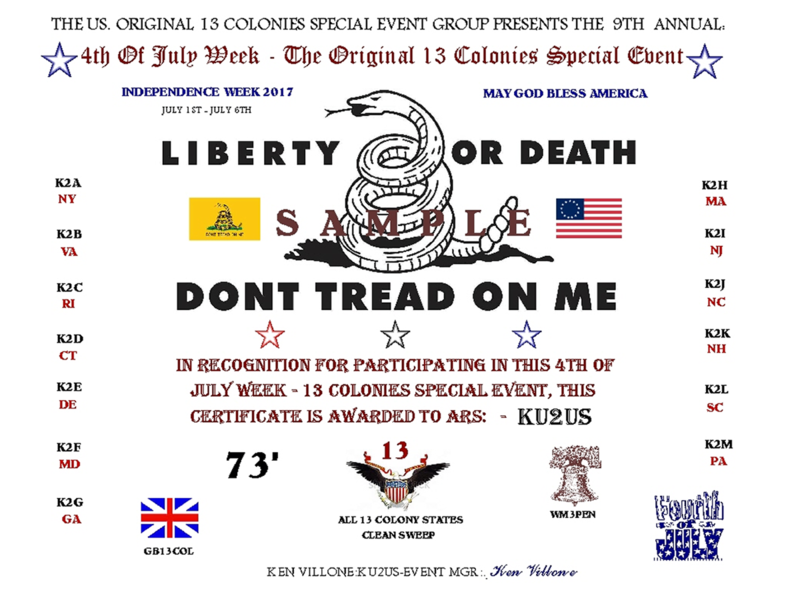 So, I did not end up getting an all CW Clean Sweep on the 13 Colonies event this year. After I got done with my chores last night, which was around 9:00 PM, I went down the basement, turned on the rig and laptop and started up Log4OM. The Cluster function allows me to filter by band, by mode, or by band and mode. I started out just by mode, CW and saw that K2B and K2C were not on any of the bands using Morse Code. For the heck of it, I switched on over to SSB and sure enough, both Colonies were represented on the phone bands. I decided to take a listen in, just for kicks. K2C, Rhode Island was on 80 Meter SSB and was calling CQ, and was very loud and clear. And apparently, very lonely. I nearly fell out of my chair! He was actually calling CQ! In my mind, I thought that Rhode Island would have been inundated under a tsunami of folks trying to get a QSO in. Rhode Island is one of the tough ones for regular ol' WAS, let alone 13 Colonies. I was surprised that the op had not much in the way of takers. I listened in on a few QSOs just because I loved the guy's (whomever he was) New England accent. We tend to think of it as a "Boston accent", but in reality that intonation exists throughout a lot of New England, not just Boston. One chaser thanked him for the QSO and the time that he must have spent on the radio all week and he answered, "No, thank YOU! We loved being heah, handin' out QSOs." Gotta love that accent! K2B, Virginia was on 20 Meter SSB. An unlike K2C, he was busy, quite a bit busy and again, that surprised me. Virginia is not one of the "rare ones" in any way, shape or form. I don't know how much time the K2B ops were able to get on during the week; but from last night, it sounded like there were quite a few Hams desperately needing Virginia for the sweep. He wasn't the loudest, but was completely readable in NJ with a lot of QSB. That made sense to me as I think 40 Meters would have been the better band for a NJ to VA QSO at that time of day. Understandably, with the event coming to a close, you want to hand out as many QSOs as possible and go out with a bang. I would have chosen 20 Meters also, were I behind the rig in Virginia. There were so many chores that kept me off the radio this past week. It was only about a day or two ago that I thought of keeping DX Summit on in the browser of my smart phone and checking that, from time to time. If I had been clever enough to think of that from the beginning of the event, I'm willing to bet I would have stood a much better chance to get a CW Clean Sweep. So as those Brooklyn Dodger fans used to say, "Wait 'til next year!" 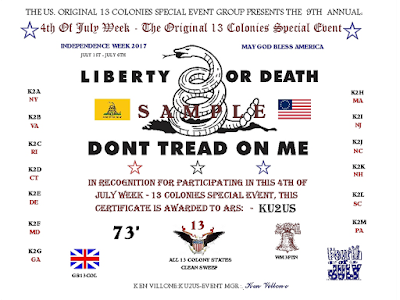 "Well another year over for GB13COL, and everybody in the team thoroughly enjoyed themselves yet again in the ever popular 13 Colonies Special Event. The team managed to work 89 unique DXCC entities and approximately 3,000 logged QSOs using SSB, CW, DStar and Digital modes. Please check the GB13COL QRZ page to see if you have been logged or not. The guys would like to thank the people who took the time to thank them for being there and trying to get them in to our Log. Facebook along with the clusters proved very popular to chat to us live and see where we were operating at any given time. Band conditions were certainly not favourable to the USA, with most of the openings occurring during 10pm to 5am local UK times. This has left some of us very tired, especially after dismantling the equipment after the last night shift. Typically, we had the odd issues due to close proximity of RF equipment, the occasional power outage and internet connection drop outs. But these were all overcome in the spirit of Amateur Radio and a useful tool kit. We hope to be part of the Special Event again next year. All the very best, Ray de G0VLF & Team GB13COL"
In the end, most (but not all, it seems) folks, from 13 Colonies ops to the very last chaser, seemed to have fun - and that's what this is really all about. Got lucky and worked K2K on 14.027! Fun times!Great ham radio blog! Looking forward to reading more! Another great blog site by WA5IEX Roland.